That Tim Ferriss guy is nuts. Brilliant, but nuts. 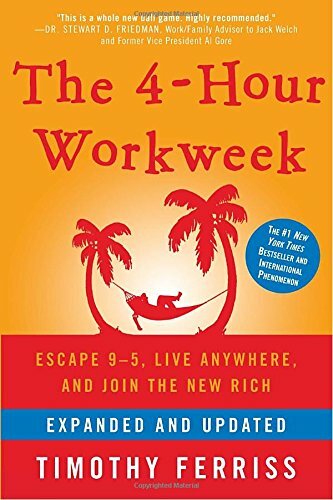 I’ve been listening to his book, The Four Hour Work Week, and it’s hard to say that much of it is applicable to my life. I’m in no position to leave my job and start my own business right now, but maybe “right now” isn’t the answer I’m looking for. He proposed many principles for how to structure your time and how to focus. I’m still early in the book, but I have been able to pull certain concepts out of his book and into my life. It’s early in this plan as well, but already I’m applying the “no multitasking” and “productive vs active” rules. The last two mornings I got myself up for a run before work, saved time to work on my own things, and still managed to have productive days. Writing down tomorrow’s goals the evening before and keeping them trim fits my hyper-organized personality. Especially if I can add some numbers to it to schedule out the day. I feel good. Bailey is acting normal again, except for the appetite. She won’t eat but a few bites of food a day. The vet says that kidney decline could result in a form anorexia. Hand feeding is working the best, but it’s still almost nothing. We’ve tried various types of wet food with different textures and temperatures, but nothing seems to be what she wants. It’s June 1st, so a new budget starts today. Time to get gazelle-intense about getting these last few bits of credit card payed off and filling our emergency fund.